We are pleased to announce Azure Analysis Services now provides integration with cloud data sources residing on Azure Virtual Networks (VNets). Organizations use VNets for enhanced security and isolation. Cloud data sources such as Azure SQL DW and Azure Database can be secured with VNet endpoints. Azure Analysis Services inbound traffic can be controlled using firewall rules. However, Azure Analysis Services requires access to data sources in-order to perform data refresh operations. If the data sources are cloud-based and secured with a VNet, it is necessary to provide access to Analysis Services. This can be done using the AlwaysUseGateway server property. Setting this property to true specifies Azure Analysis Services always use an On-premises data gateway for access to data sources - whether or not the data source happens to be cloud-based. It therefore requires the On-premises data gateway is set up as described in this article, and the gateway computer resides on the VNet. Data refresh operations are directed to the gateway machine, which in-turn can successfully access the data source(s). The AlwaysUseGateway server property can be set by using SQL Server Management Studio (SSMS). 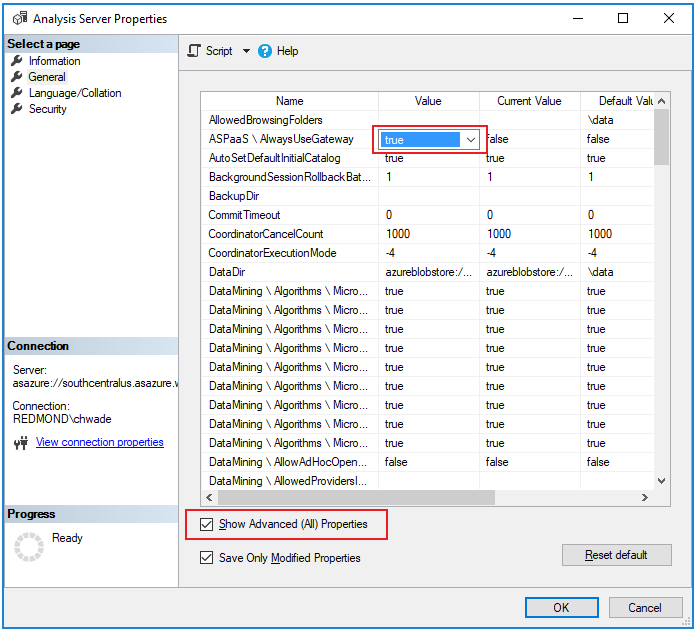 Connect to the Azure Analysis Services server, right-click on the server, select Properties, General, and Show Advanced (All) Properties.